Facebook is expanding its Deals local business discount service to compete directly with so-called "social buying" coupon sites such as Groupon and Living Social. The new service will debut soon in five test markets including Atlanta, Austin, Dallas, San Diego, and San Francisco. "We will test a new feature for our Deals product that allows people to buy deals on Facebook and share them with their friends. Local businesses will be able to sign up to use this feature soon and people will be able to find Deals in the coming weeks," Facebook says in a statement. The new social buying feature expands the Facebook Deals service launched in November. 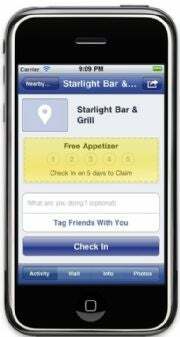 Deals offers you coupons from businesses in your immediate vicinity when you check-in using Facebook's location-sharing service, Places. Deals features general coupon deals such as 20 percent off jeans as well as loyalty-based offers such as "buy nine lattes get your tenth free." It's not clear if Facebook's new coupon service will require a specified number of buyers before the deal goes into effect, as Groupon does. Facebook says it wants to focus on offering deals you're more likely to want to do with others. "You won't get your legs waxed with friends," Emily White, Facebook's director of local operations, told The Financial Times. "You dine out, you go to concerts, you do outdoor activities. We want to make sure those experiences are maximized." The new coupons will reportedly come directly from Facebook as well as from partner deal sites such as Gilt City, PopSugar City, Tippr, and Zoni. Local coupon deals appear to be the hot new trend among tech companies. Google in December failed to buy Groupon for a reported $6 billion and later started planning its own local coupon service. Amazon recently invested $175 million in the coupon site LivingSocial. Location-sharing service Foursquare on Wednesday expanded its Specials feature, which allows businesses to offer seven different deal types to Foursquare users. Businesses can choose among coupon types such as "Flash Deals" for people who check-in to a business after a specific time or a friends deal when you check-in to a location with three people or more.